Welcome to our blog! Here you may follow the chapters of wee Doodle's unfolding life, and learn about what it is like to have a pet turkey. We're going in blind here, and are by no means experts. 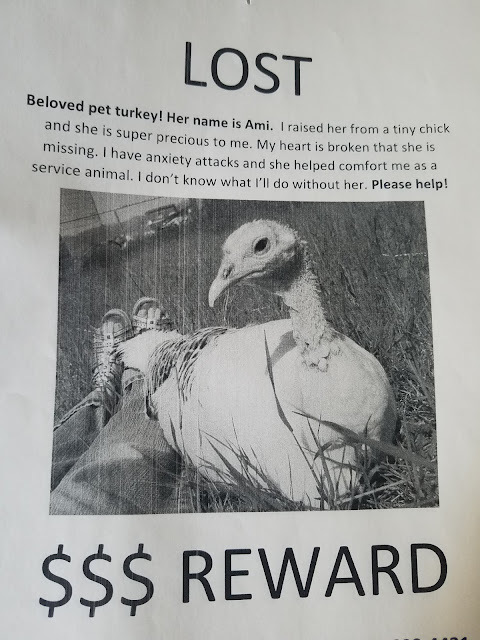 But, it is our hope that others who either wittingly or unwittingly enter the ranks of pet turkey owners, as we did, will find useful information on what to expect from your little guy without fear of learning how to pluck, stuff, and roast him within a few paragraphs. 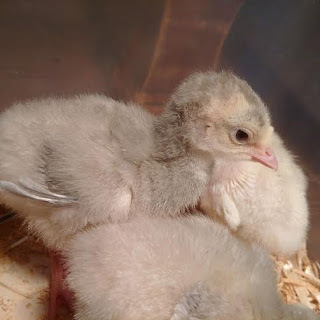 The babies got here yesterday!! They are so cute. Oh my goodness. Shipping apparently did them no worse for the wear, as they were all cheeping and happy when we got them. Also, I think I was completely wrong at guesstimating Doodle's age when we first got her. Doodle had more feathers on her tiny wings and was baby-turkey-shaped when we got her. 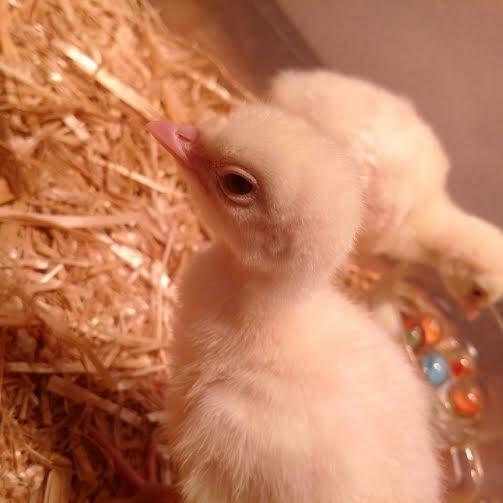 These guys are egg-shaped, and still had their egg-teeth (those dropped off a few hours after their arrival though). 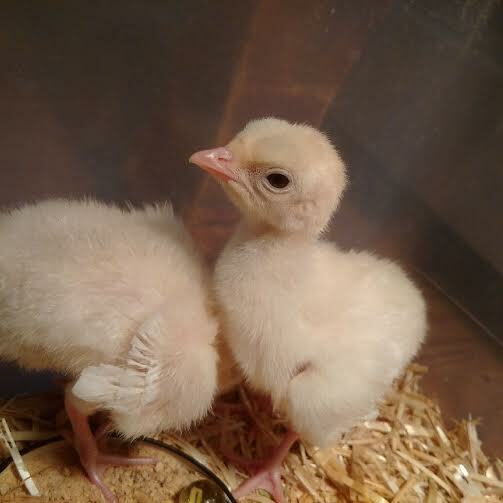 They almost look more like chicken chicks. That means Doodle is probably about a week older than I thought. 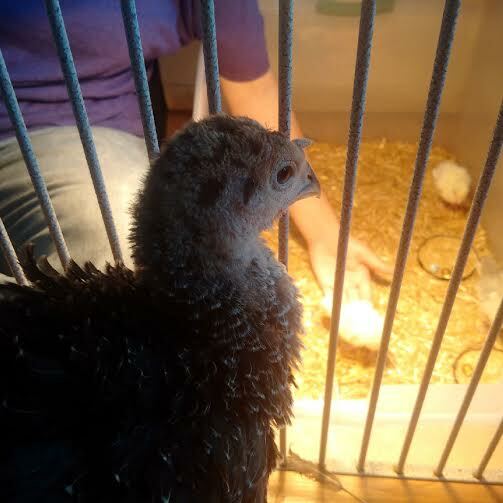 Doodle's opinion on the babies so far has been mixed. When they first arrived and started cheeping and running around, Doodle was blissfully excited. I've never heard her make so many cutts and happy-princess-bird noises (still don't have an official name for that one) in all her life. After the initial excitement wore off, however, she began to be a little jealous of all the attention I was giving them. She demonstrated this by making the lost call over and over at the tops of her turkey lungs, in spite of the fact I was sitting right there, staring at her, and asking her what her problem was. "KEE! KEE! KEE! (I'm lost)" she insisted, defiantly matching my eye. She did not stop this tom-foolery until I scooped her up into my arms and gave her a back and neck rub. of I'm lost, and mom's a criminal!" She has since learned that as long as the babies are there, I will be too, because whereas Doodle had gotten big enough for me to slip off to my own bed at night (abandoning her), the 24/7 watch process has started all over again with the little guys. 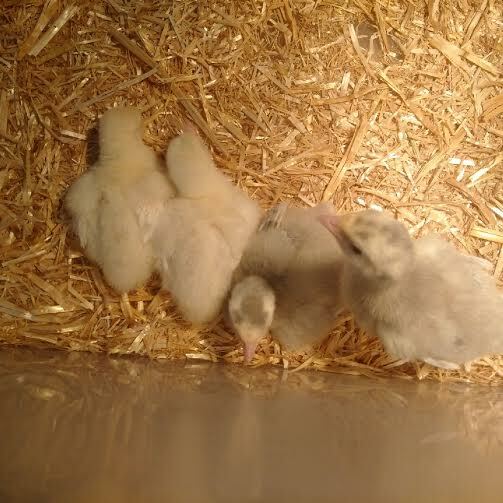 And now, without any further ado, the line up of the new arrivals: names, pictures, and introductions! First up, there's Calligraphy! (We decided to "Art Theme" everybody's names since Doodle is Doodle.) 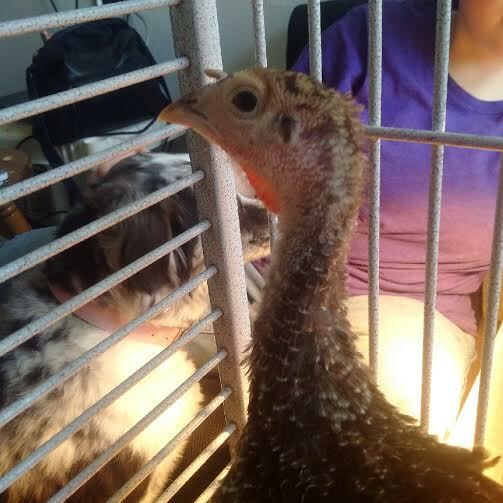 We ordered just one other turkey originally, a Royal Palm. But the hatchery called and said that they had to include two more chicks to the order to ship them. So we ultimately ordered two Palms and a Blue Slate. They sent us an extra Slate just in case, and that's this little guy. We think he's the tom of the bunch, because his legs are noticeably thicker than all the others. I was worried about him at first because, of the lot, he seemed the slowest to catch on to what food and water were. He seemed the only one ill-adjusted to his new surroundings, just kept making the lost cry and refused to drink for a good while there. But, our perseverance won out in the end and after several times of dipping his beak and screaming about it, he finally got the idea. Since then he has really mellowed out. I've only known him for about 24 hours since we picked him up yesterday, but he seems to be a pretty relaxed little dude now. And so photogenic! Look at him! I could take a billion pictures of him, seriously, he always gives me his good side. We're going to call him Cal for short. If you look up at the first picture I posted, Cal is the third from the left with the big blotch on his head. The one with a more speckled head at the end is his twin sister. Next is Chibi! She is the sweetest, snuggliest, fluffiest little plush ball I've met since Doodle. She, and her twin sister (soon to be introduced), are just packed with personality! They were very quick to catch on in figuring out what food and water was, just because they are so naturally inclined to be inquisitive and interested in what we were doing. She is very soft, mild mannered, and laid back. So much so, that I was really worried about her last night. All she wanted to do was sleep. I couldn't believe such an anomaly--WHAT? A baby turkey that actually SLEEPS at NIGHT? What madness is this?! 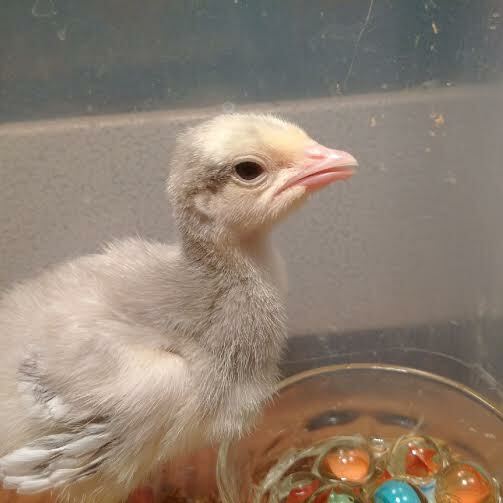 While the other baby turkeys were princess-bird-cheeping over a midnight snack, I woke her up to join them. She just numbly wandered around like a sleepy ghost with her eyes closed before walking into a wall and going back to sleep. This morning, though, after a full night's rest, she is as fit and chipper as a fiddle! Then there is Cal's evil twin, Pastel. Nah, she's not evil. But she is a bit of a bully. She seems to have the attitude that because she's smarter than everyone else, she ought to be the boss. And the boss gets to do whatever the boss likes, because she's the boss. She likes to spend time with Cal in a rousing game of "my head's higher than your head, so sit down or I'll peck your eye out". She also enjoys stealing food from the other baby turkeys, and stepping on the heads of anyone who dares sleep while she is still awake, whether or not they are in her way. 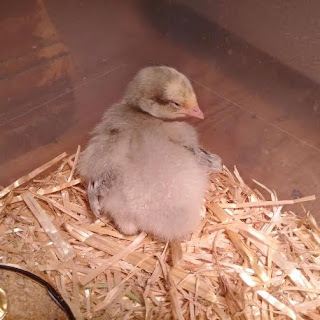 Her most recent stunt and my particular favourite, was when Chibi was sleeping in the corner of the brooder, and here comes Pastel. I thought to myself, oh dear, she's going all the way over there just to go step on poor Chibi's head. But no, that was not what she was thinking at all. Instead, she climbed over Chibi, who, affably, just shuffled over to make room for her. In a very routine, casual manner, Pastel promptly chickenscratch-kicked Chibi out of the way. The latter was sent cheeping and scrambling backwards while Pastel settled down to sleep in the corner she had just claimed all for herself. This is just how things are done. If you're going to succeed, you gotta just take it. Pastel would make a great business woman, a CEO or managing position of some sort, I think. And last but not least is the perky, fun-loving, affectionate Amigurumi! She was named after the Japanese art form of crocheting small plush animals! Ami loves to cuddle everybody. She cuddles our hands, she cuddles Cal, she cuddles Chibi, the water dish--she even cuddles Pastel (who seems to expect that sort of behaviour from a simpleton). We can tell her apart from Chibi because her head is smaller and her eyes are bigger, doubling that adorable inquisitive look of hers. She is full of life and fun! Though her wee wings are little better than barely-feathered t-rex stubs at the moment, she likes to run as fast as she can, hop up in the air, and flap them like crazy in pursuit of the dream of someday being able to fly. Unfortunately, these sorts of stunts usually result in her falling over onto her back and kicking her tiny legs like crazy in pursuit of the dream of being able to stand up again. But that doesn't stop Ami. 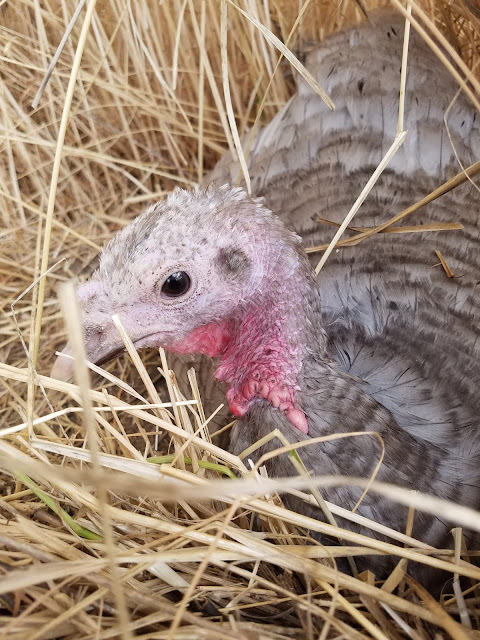 She, like most turkeys, lives by the motto of "If at first you don't succeed, try it again, exactly the same way as you tried it before, and if you try it enough times, eventually you'll succeed.... right?"